Beat high scores across 15 beautiful courses set in amazing locations across the globe. Have a Quickshot, embark on a World Tour and more! Bunkers, trees, water and wind will test your mettle as you drive for the high score. Smash the brand new game mode, Eliminator! 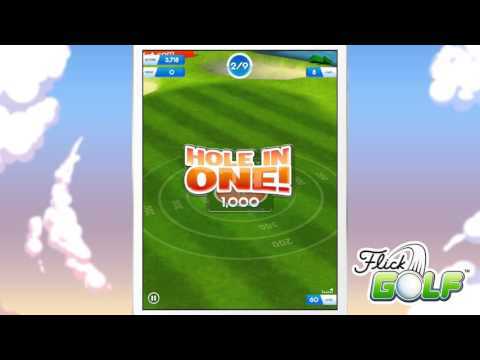 How many consecutive hole-in-ones can you hit? Share scores with your friends and compete to be the true master of Flick Golf. It's perfect one finger gameplay! Now with cutting-edge Full HD graphics. JOIN THE FULL FAT COMMUNITY! 완벽한 홀인원을 싱크하기 위해 공을 톡! 우리의 서명 후 터치 컨트롤을 사용하여 스핀과 곡선을 추가합니다. 그것은 당신이 페어웨이에 미칠 수있는 가장 재미! 전 세계적으로 놀라운 위치에 설치 (15) 아름다운 과정에 걸쳐 높은 점수를 이길. , Quickshot이 월드 투어 더에 착수! 당신은 높은 점수에 대한 드라이브로 벙커가, 나무, 물, 바람은 당신의 기질을 테스트합니다. 새로운 게임 모드, 제거기 스매쉬! 당신은 얼마나 많은 연속 홀 - 인 - 사람을 공격 할 수 있습니까? 당신의 친구와 공유 점수와는 톡 골프의 진정한 마스터로 경쟁한다. 그것은 하나의 손가락 게임 플레이를 완벽! 이제 최첨단 풀 HD 그래픽.